I am insanely in love with ice cream - always have been and always will be. There is not a dessert I crave more than ice cream. I finally bought an ice cream maker and have been dying to try it out. I wanted to start with a relatively easy ice cream, but also definitely something that would show worth of purchase to my husband. Most of his favorite ice creams include chopped up candy so I knew that was the route I had to start with! This ice cream was super easy and so delicious. I know a lot of ice creams are custard based so a bit more rich that this, however I think this is perfect for a scoop after dinner - satisfies the sweet tooth without sitting too heavy the rest of the night. I will admit that I was a bit hesitant that this recipe called for raw eggs, but after some Googling I realized that it wasn't a huge deal. Now, if I were feeding this to young children, the elderly or someone with health problems I would have maybe looked for another ice cream base, such as this one, but for us this was fine. 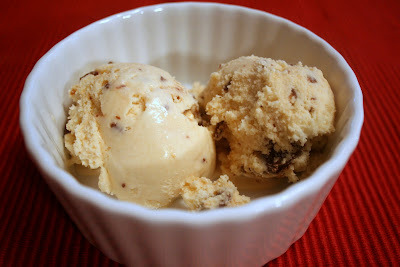 So, now that I have an ice cream maker that I know I can use - what flavors should I try next? Using a sharp knife, coarsely chop the candy bars into large chunks. Place the chunks in a bowl, cover, and freeze for about an hour. Whisk the eggs in a mixing bowl until light and fluffy, 1-2 minutes. Whisk in sugar, a little at a time, then continue whisking until completely blended, about 1 minute more. Pour in the cream, milk, vanilla and whisk to blend. Transfer the mixture to an ice cream maker and freeze according to the manufacturer's instructions. After the ice cream has stiffened, transfer half of it to an air-tight storage container. Top with half of the candy bar pieces and mix until candy pieces are evenly mixed throughout the ice cream. Top with half of the cooled caramel and swirl in the ice cream using a knife or skewer, to swirl the caramel throughout. Repeat with remaining ice cream, candy pieces and caramel sauce. Store in freezer until the ice cream is ready. In a heavy saucepan over medium-high heat, combine the sugar, water and lemon juice. Cook until it turns amber, 6-8 minutes. Stir the sugar with a wooden spoon during the first 1-2 minutes of cooking; do not stir after this point and, instead, tip the pan to ensure even cooking. Do not allow the sugar to burn. If the sugar burns, turns dark and smells acrid, discard and start again. Remove the pan from the heat and very carefully pour the cream in to the hot syrup. Take care if does not splash; it will be very hot. Stir with a long-handled wooden spoon until the sauce is smooth and blended. Let the sauce cool to warm or room temperature. Use immediately, or cover and refrigerate up to 3 days.